Japan has picked as mascots for the 2020 Tokyo Olympics and Paralympics a pair of characters with a futuristic checkered pattern design similar to the official logo, with kids having made the final choice in an Olympics first, the games' organizers said Wednesday. Classrooms at elementary schools across Japan were given one vote each, with 205,755 classrooms at 16,769 schools casting ballots for the three shortlisted pairs between Dec. 11 and Feb. 22. "It looks futuristic but also represents Japan's traditions," said Miyu Kawa, 12, who voted for the design. "Its color and shape give a sense of unity and are suited for the Olympics and Paralympics that involve people regardless of their position or nationality." 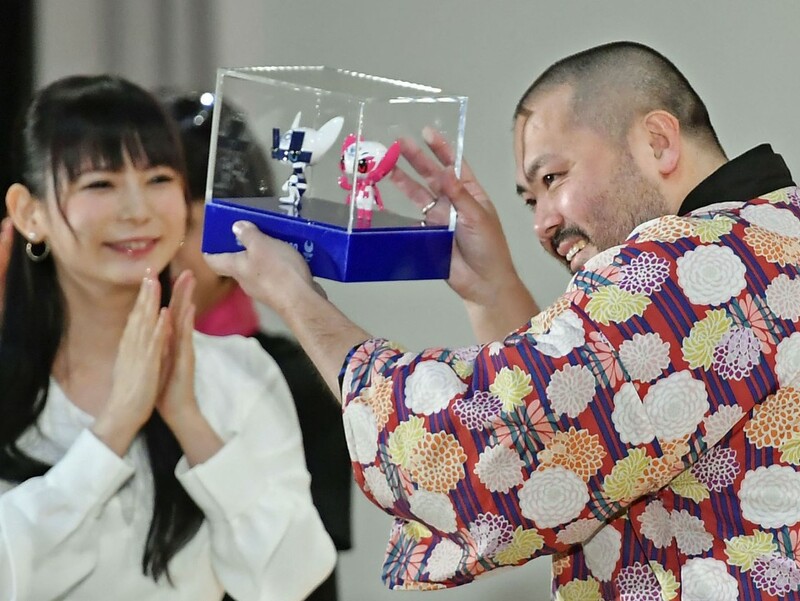 The winning pair, which received 109,041 votes, was created by designer Ryo Taniguchi, 43, from Fukuoka Prefecture. The Olympics mascot is in dark blue and white, while the Paralympics one is pink and white. "My mind went completely blank. I have to let my beloved wife know about it soon," Taniguchi said after the winners were unveiled at a ceremony attended by some 560 children at a school in Tokyo's Shinagawa Ward. 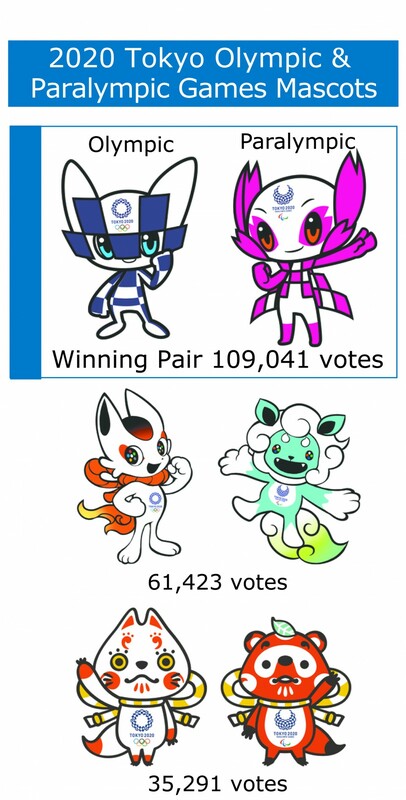 "The Olympics first ever attempt (to have kids choose the mascots) ended in a big success," said Toshiro Muto, CEO of the organizing committee, praising the turnout of over 70 percent in voting. Roughly 21,000 elementary schools nationwide were eligible to join the process. 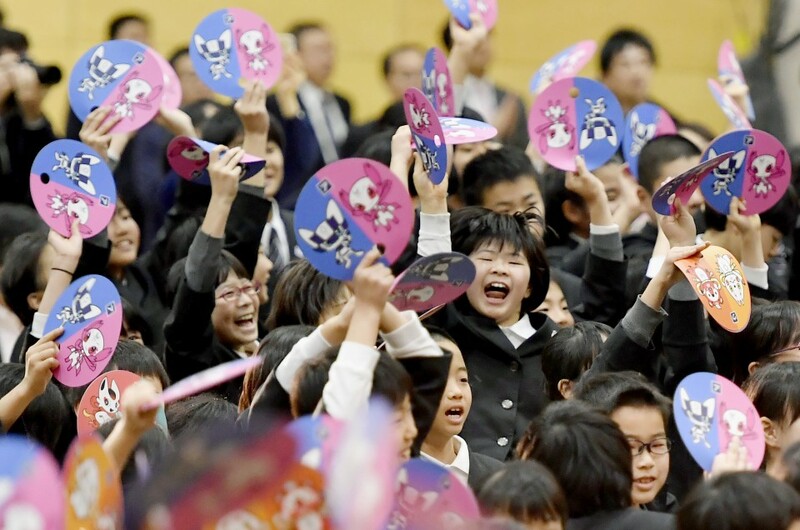 Yoshiro Mori, the committee's president, also welcomed the outcome, saying, "We have two and a half years to go, so we would like to promote Japan and the Tokyo Olympics using these mascots." The mascot selection process involving children was introduced to get kids enthused about the games while also guaranteeing transparency in the selection process. The initially chosen official games logo was met with plagiarism allegations and then scrapped. The other two pairs of candidates selected from some 2,042 designs submitted by the public also incorporated elements of traditional Japanese culture. One pair consisted of a character for the Olympics that combined the features of a fox, often seen at shrines, and a cat, traditionally believed to invite fortune in Japan, and a Paralympic mascot modeled on a stone-carved guardian dog installed at shrines. The other pair was a fox with an ancient Japanese comma-shaped bead design for the Olympics and a raccoon dog, another animal often appearing in images in Japan, for the Paralympics.